Instantly manage and adjust pricing for all of your products everywhere you sell online. SellerActive’s channel management dashboard gives you the power and flexibility to list and update your products across most top marketplaces—all from a single location. Oversell no more. Our software allows you to manage single and bulk listings in just a few clicks. As soon as you make a sale or update your inventory, SellerActive automatically coordinates product quantities in every e-commerce channel you do business. Add, subtract, or replace quantities for numerous listings at the same time. The SellerActive platform automatically makes adjustments based on vendor information, and remaining item quantity updates can be completed through our Scan and Load tool or Microsoft Excel spreadsheet upload. Say goodbye to uncertainty and wasted time. SellerActive’s cloud-based dashboard is accessible from any tablet or computer, with a host of features—from product images to Amazon sales ranks—available at your fingertips. Get the tools you need to grow your e-commerce business. SellerActive users gain access to full inventory and order management (via our integrated partners), unlimited repricing, warehouse management, bulk listing tools, and more. Island Watch sells unique, quality timepieces from all over the world at affordable prices. When Marc started his business, e-commerce was in its infancy. As his business expanded into more sales channels, Marc needed a channel management system that helped him coordinate inventory listings across multiple marketplaces and avoid overselling and stock-outs. Spend less time painstakingly creating new listings, adjusting pricing and quantities, and fulfilling orders manually within each marketplace. SellerActive’s multichannel e-commerce automation and bulk editing capabilities drastically reduce the time and frustration of selling online. SellerActive started as a multichannel solution for online retailers, and our list of integrations continues to grow, with more marketplaces, shopping carts, and integration tools added constantly. SellerActive's cloud-based channel management system continually communicates with your sales channels, so you're never in danger of overselling. Looking to expand into new marketplaces? 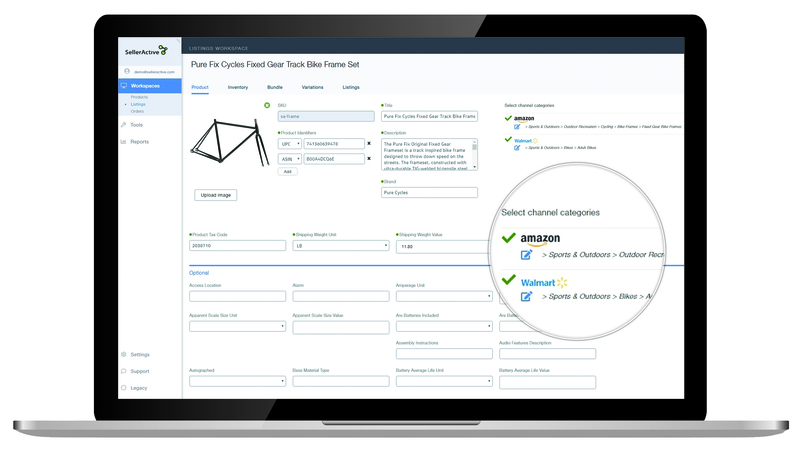 Save time and grow your business efficiently with our product listing tool, which works with Amazon, eBay, Walmart, Jet, and more e-commerce channels. Upload multiple listings at once through an easy-to-use template. Follow the marketplace category prompts to quickly and easily publish your listings in just a few steps. Don’t waste any more time searching for the right photos of your products. Import images and dimensions from the Amazon product catalog to all of your other listings. You need accurate, real-time business data to make the right strategic decisions for your business. Our platform provides you with the all the information necessary to monitor your sales results and stay agile and competitive. Plan ahead. SellerActive shows you historical data on both your competitors’ and your own sales trends, so you can gain valuable insights and develop industry-specific strategies. Don't leave money on the table. Meet customer demand instantly through low-stock thresholds and convenient alerts that ensure you’ll never miss a sale. "This program streamlined our inventory management needs. It has been amazing to see a company that's so dedicated to helping their customers. There have been so many features that we request that have been implemented not only custom to our account, but also into the base program. It's very responsive and very easy to use." 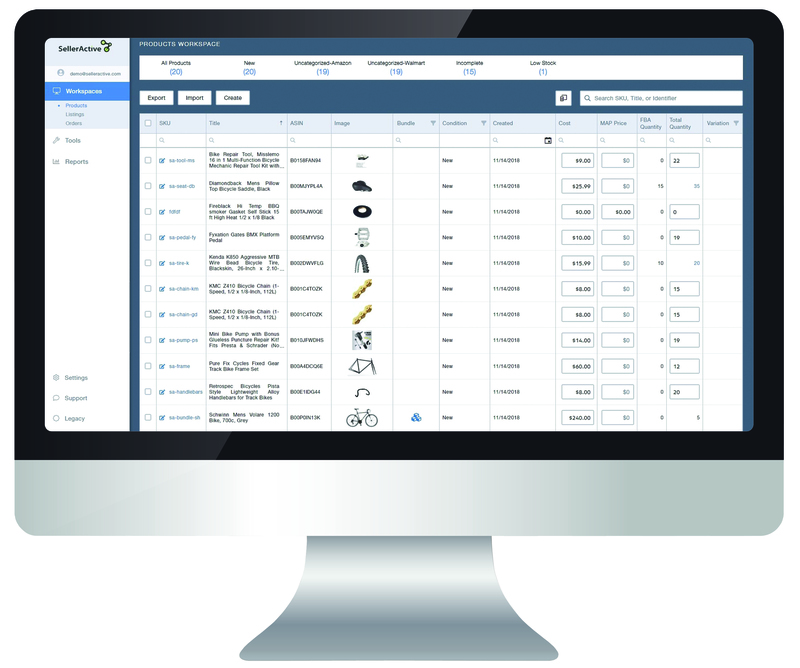 SellerActive’s integrated order management tools provide your unique business the necessary elements for successful multichannel e-commerce. From rule-based to fully algorithmic, our customized pricing strategies can empower your unique business maximize profits and increase sales, on your terms.